Headquartered in the heart of New York's financial district since 1792, Cadwalader is located only blocks from Ground Zero. All of our personnel were deeply moved by the events of September 11 and remain committed to those affected by the attacks. Among our most compelling stories is our efforts, which continue today, on behalf of the families of the September 11 victims. In the immediate aftermath of the terrorist attacks, Cadwalader committed substantial funds to help restore, rebuild and revive the New York City downtown area, and to the Twin Towers Fund, the New York Times 9/11 Neediest Fund, the American Red Cross and the Salvation Army to assist in the World Trade Center disaster relief and recovery efforts. Contributions were supplemented by individual pledges to the organizations. The firm was a leader in the New York legal community’s response to the terrorist attacks. We registered with the New York State Bar Association to provide free consultation and representation to disaster victims and to handle legal needs related to real estate, trusts and estates and litigation for individuals and small businesses. We also provided free legal services to the families of Ladder 11, New York City Fire Department, which lost six firefighters at the World Trade Center. New York’s former Chief Judge Judith Kaye commended the firm for its "leadership role in providing a guide to benefits" in reference to our self-published Handbook of Public and Private Assistance Resources for the Victims and Families of the World Trade Center Attacks. Our efforts have been praised by the New York State Senate, the Legal Aid Society, the New York State Bar Association, The New York Law Journal, and the American Bar Association, among others. In February 2011, Cadwalader hosted a private screening for personnel and alumni of “Out of the Ashes: 9/11,” a compelling documentary by Professor Marilyn Berger, Director of the Comprehensive Trial Advocacy Program and Director of Films for Justice Institute at Seattle University Law School. The film, which features former partner Debra Steinberg and one of her clients, examines the legal, moral, and ethical ramifications of the Victim Compensation Fund, created to reimburse those who were injured or lost family members in the terrorist attacks, and its impact on the civil justice system. The firm is a proud supporter of Project Rebirth, the not-for-profit organization stemming from the creation of the feature-length documentary Rebirth. Since shortly after the attacks, leading figures from Hollywood, Wall Street, local government, private businesses, and academic and medical institutions have united to support the multi-year development of the film that records the strength of the human spirit coping with disaster and the ongoing redevelopment of the World Trade Center site. Cadwalader serves as the home of a Rebirth Vista Vision camera, which, with a 24 mm. lens and 1000 ft. of film reloaded every 21 days, takes an image every 3:45 minutes, 24 hours a day, 7 days a week, to monitor the rebuilding from an east facing angle. 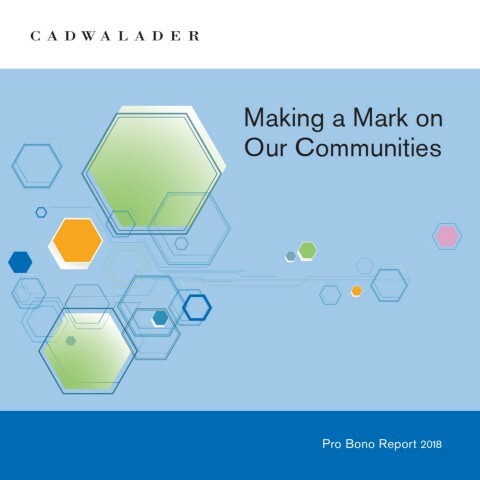 Cadwalader is also a supporter of the September 11 Memorial and Museum. As a result, the firm was invited to take part in signing steel beams that will be used in the construction of the memorial and museum. The signing took place in Battery Park where visitors were able to preview plans for the memorial and museum, which is currently under construction at the World Trade Center site, as well as write personal messages through “notes of hope.” These notes will be permanently preserved in the museum’s archives.